There are so many advantages to creating watch cases, bezels and crowns with bronze that it’s a mystery why it is used so sparingly. First it’s as durable as any material available. It’s inexpensive and as it ages it develops a unique patina for a vintage appeal. The standard formulation of bronze is made mostly of copper with 12% tin. However, the percentage of tin can be altered and the two main ingredients can be mixed with the addition of other metals, such as aluminum, manganese, nickel or zinc, and other materials, such as phosphorus or silicon. These additions produce a range of alloys that may have a variety of uses, or can even be used to manage how the case will look as it ages. This allows brands to create a material for specific purposes. Bronze cases have largely been used for divers’ replica watches since the material is virtually rust proof but it does have other stylish uses. At SIHH 2017, Montblanc introduced three new editions to the 1858 Collection, using bronze to create a vintage looking timepiece that takes its inspiration from the chronographs of the 1930s. Two models — the Montblanc 1858 Automatic Dual Time and the Montblanc 1858 Automatic Dual Time — feature a bronze bezel mounted on a steel case, which the brand says is a first in the history of watchmaking. Meanwhile, the 44mm 1858 Chronograph Tachymeter Limited Edition 100 fake watches are all-bronze watch with the exception of the back, which is made of titanium to avoid allergic reactions — a disadvantage of using bronze for a watch. The bronze alloy created by Montblanc for the collection is designed to develop its own patina as it wears, the company said. 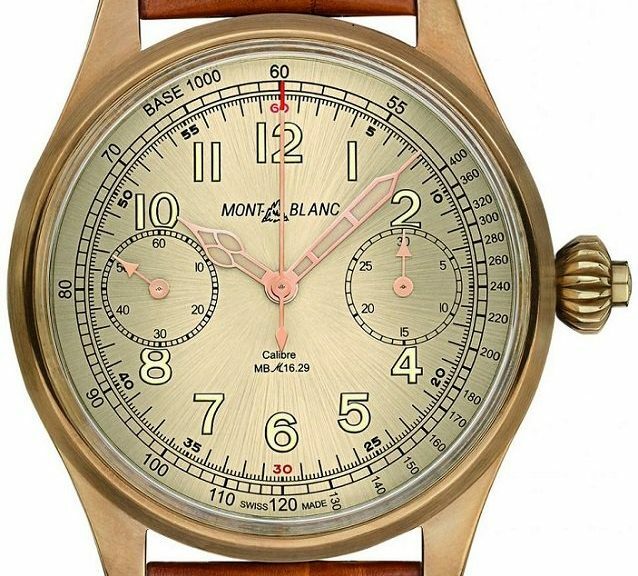 The watches are modeled after Minerva chronographs used by pilots in the 1930s. 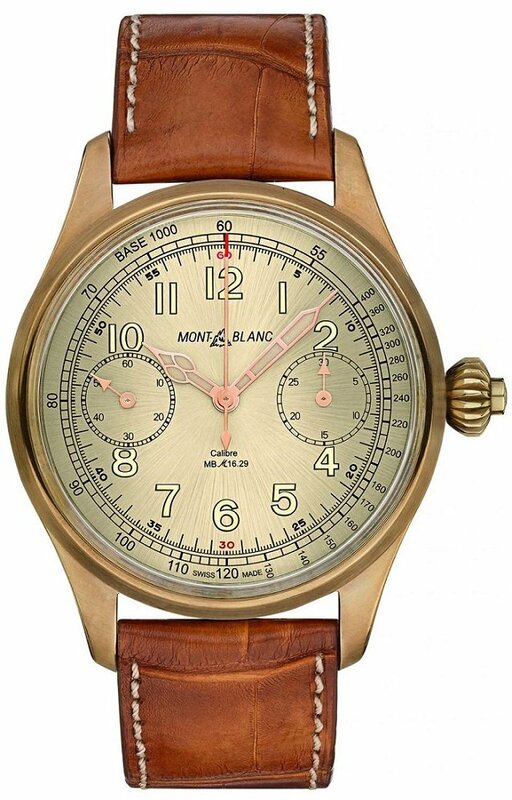 The use of bronze complements the colors of the dials, antique-styled straps, 1930s Montblanc logo with its historical font and emblem of the Mont Blanc Mountain in the center, and other vintage elements. 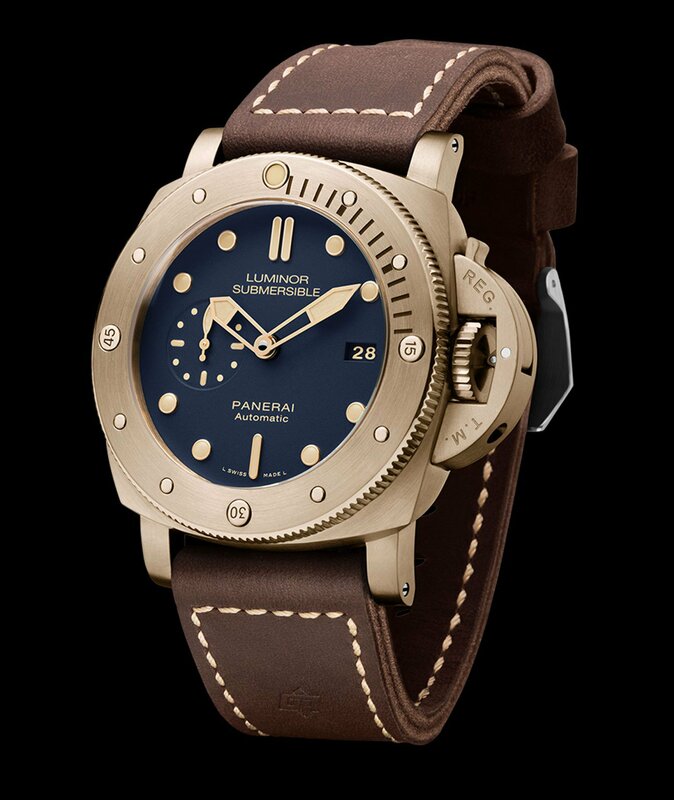 Also at SIHH 2017, Officine Panerai replica watches introduced its newest version of the Luminor Submersible 1950 3 Days Automatic Bronzo. The bronze used to make the case and the classic bridge device protecting the winding crown for the 47mm watch is a company-specific alloy of copper and tin, which is highly resistant to the corrosive action of sea water and atmospheric agents. This is the first version of the 47mm divers’ watch since it was introduced in 2011. Like the original it is available in a limited edition of 1,000 pieces. For the first time it is available with a blue dial.